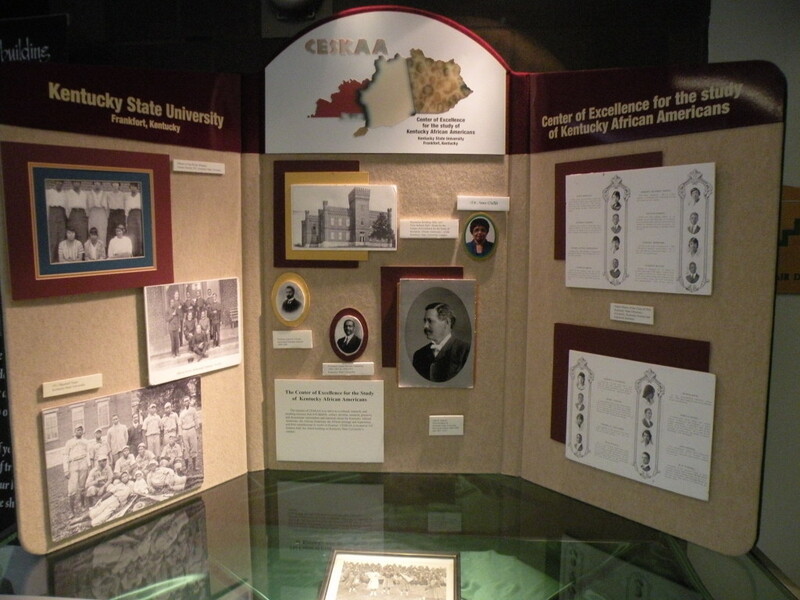 The Center of Excellence for the Study of Kentucky African Americans is devoted to the collection, preservation, interpretation and dissemination of materials about African Americans in Kentucky and those with Kentucky connections residing throughout the nation and around the globe. CESKAA focuses on uncovering documents and rare books, public and private records, photographs and audio visuals and other historic items that enable us to restore to public memory the myriad contributions that African Americans made and continue to make to help develop the Commonwealth and improve the quality of life for African Americans. This information has largely remained unrecorded and therefore absent from textbooks and historical narratives. Materials that are collected, both print and three-dimensional artifacts, are maintained in archival and museum collections. These items are used for research and scholarly study, documentaries, exhibits and public education programs. Our scope of coverage includes documents and artifacts, people and historic places that provide context and that are dispersed across the entire Commonwealth. The collections include materials from KSU alumni and former faculty members. The Kentucky Civil Rights Hall of Fame was established in 2000 by the Kentucky Commission on Civil Rights during its 40th anniversary celebration. This special recognition serves as a monument to brave men and women who emerged as leaders in the struggle for equality and justice in the Commonwealth of Kentucky. Their contributions span areas of access, equality, and efforts to eliminate barriers of prejudice and discrimination. Currently photographs of 52 inductees are enshrined in the Hall of Fame. Additions are made in two year cycles. Constructed of wood and steel and stretching 52 feet with photographs on both sides, this exhibit was designed by Garry Bibbs, associate professor of art studies, head of sculpture and director of graduate studies at the University of Kentucky. The Hall of Fame has found a permanent home on the Kentucky State University campus, is under the supervision of CESKAA and may be viewed daily between 8 a.m. to 4:30 p.m. in the Carl Hill Student Center Ballroom. The artist, Garry Bibbs, is an alumnus of Kentucky State University. The Civil Rights Hall of Fame is designed as an educational tool to raise public awareness about civil rights issues and to foster an environment that engenders discussions regarding the history of civil rights in Kentucky as well as the continuing challenges.